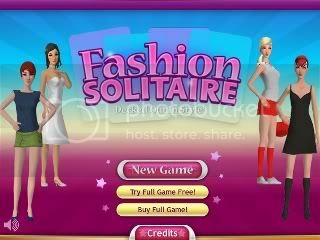 dressing people up, this game is TOTALLY for you! I was up till 3 AM last night playing this game. It's so addicting. Fashion Solitaire - the object of the game is to dress up all the models, whilst incorporating their key pieces to make as much money as possible. Seems simple, right? 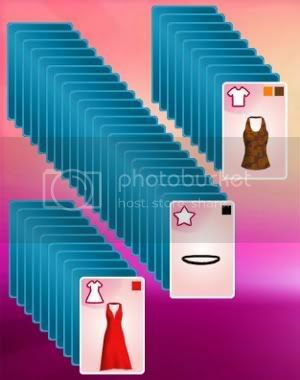 Now the clothes you're using are on playing cards and come in different styles and colors. The cards are spread out and, like solitaire, you get open places to store cards and you can't get to a card without using the piece on top of it. So like solitaire, there are points where no more moves can be made and you have to start the game all over again. Every level means more models, more key items, and hard card layouts. I like trying to put together different outfits for every level. The only drawback is that the free version only has the "Night on the Town" dress setting and you have the buy the others that look like they'd be much more fun. Either way, if you're looking to waste time, play this game. And don't forget to layer! !